This humble building was erected as the Society Hill Library Society around 1826. The society traces its roots to Saint David’s Society, organized in the Pee Dee in 1777. At that time the lands that now make up Chesterfield, Darlington, and Marlboro counties comprised Saint David’s Parish. The Saint David’s Society was created by local planters who wished to emphasize education within the parish. The Revolutionary War disrupted the Saint David’s Society’s plans to build a school. However, the group finally established a school in 1786 near Long Bluff (no longer extant) and called it Saint David’s Academy. By 1798 Welsh Neck Baptist Church – originally located in the low-lying community of Welsh Neck east of the Great Pee Dee River – moved to higher land adjacent to the school. From there a community grew as people relocated from Welsh Neck and Long Bluff. 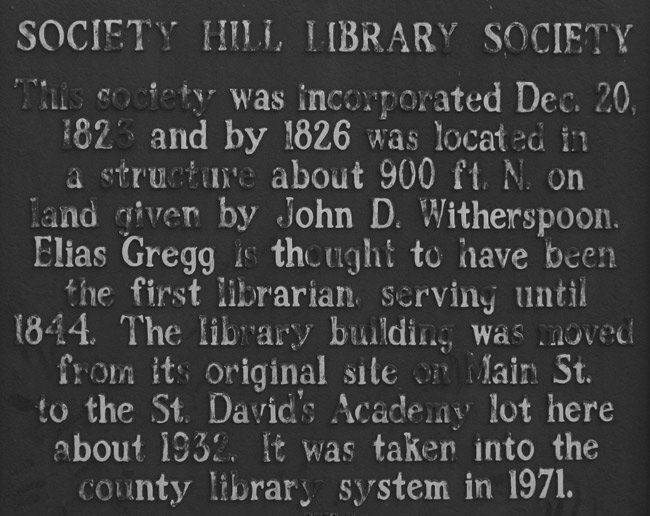 The new village was called Society Hill in honor of Saint David’s Society. 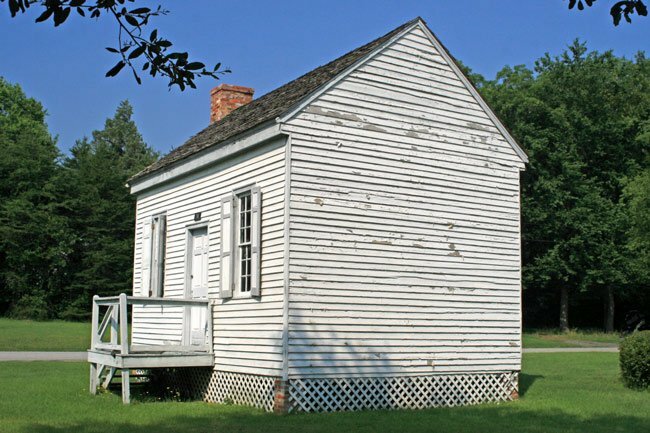 In keeping with the village’s commitment to education, in June of 1822 twelve residents donated $20 each towards buying books for a future library to be used as a resource by academy students as well as the public. 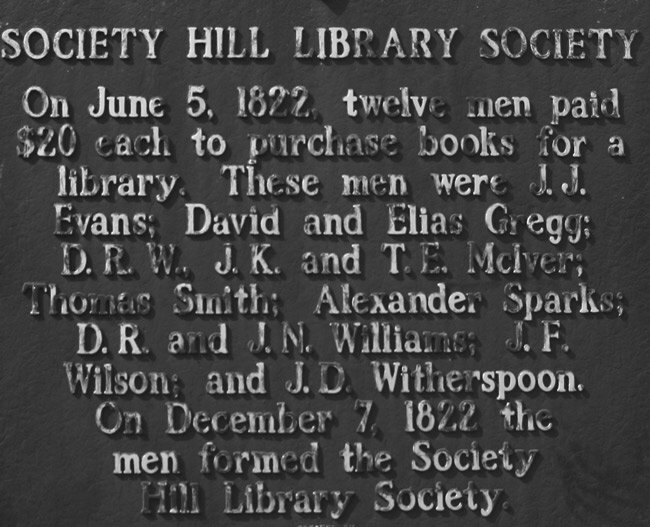 By that December the Society Hill Library Society was formed, and in 1826 the library was operating on a Main Street property donated by John D. Witherspoon. It was one of the first public libraries in the state, and eventually as many as 2,000 volumes were kept in this small building. At some point the library building was moved to its current site near Town Hall. It was restored in 1971 by the Dogwood Garden Club and the Society Hill Township and subsequently reopened. The library also was once housed in a brick building on the grounds of Saint David’s Academy. A modern library was built in 2011 on Carrigan Street. The Welsh Neck-Long Bluff-Society Hill area is one rich in historic significance. The Welsh Neck community was an early religious center (a ca. 1738 Baptist church was established here) for the Pee Dee region, and Long Bluff served as a judicial center. 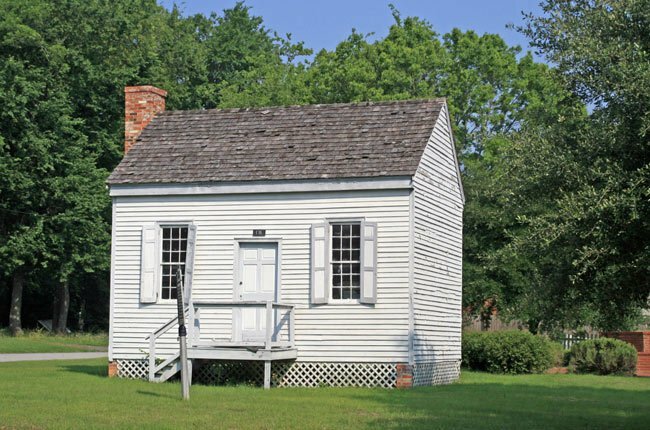 The courthouse at Long Bluff, with its jail, tavern, and supporting buildings, was a center of activity for the Upper Pee Dee region during the Revolution. Few small communities have contributed more to the public in the way of culture, education and leadership than has Society Hill. It has numbered among its population outstanding leaders in religion and education, jurists, statesmen, soldiers, authors, and agriculturists. The Society Hill Library Society was formed in 1822. This group grew out of the St. David’s Society, founded 1777 in Cheraw, which had a wide-spread influence and was a main factor in making Society Hill a center of intelligent leadership in the Pee Dee for a century and a half. This is a rural community with many fine antebellum homes in the Georgian mode. Constructed on large lots or in wooden settings, many are two-storied clapboard structures with one-story front verandas. Nineteenth century mercantile establishments still operate in unadorned frame buildings of a purely functional design. Within the entire district there are approximately 250 structures. Welsh Neck and Long Bluff, both now unoccupied wooded areas, are considered excellent potential archaeological sites.